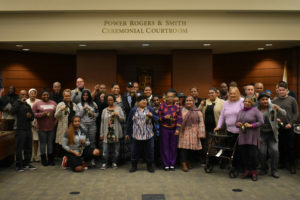 Community leaders, legislative allies, coalition partners, funders, donors, and staff of the Chicago Coalition for the Homeless came together Dec. 6 to celebrate CCH victories. The 5:30 p.m. event was hosted at Loyola University Chicago School of Law, in its 10th floor ceremonial courtroom. 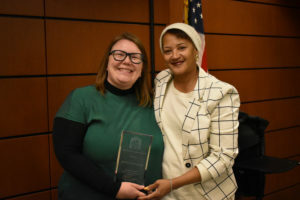 CCH honored seven people, including legislators and allies, as well as Urban Labs, Polk Bros. Foundation, and the Steering Committee of CCH’s HomeWorks coalition. Each year CCH presents the Les Brown for Excellence in Public Policy Work. We honored the UChicago Poverty Lab and Health Lab for their report: Ending Family Homelessness: Understanding the Scale and Needs of Families Experiencing Homelessness in Chicago. The report cross-matched data from the Chicago Public Schools (CPS) and the city’s homeless service system. The data showed the full scope of families living doubled-up in Chicago as well as demonstrating how doubled-up homelessness is a common pathway into staying in shelters. Their research has led to a much greater understanding and acceptance of this form of homelessness, not previously been recognized by the city. CCH also presented the John “Juancho” Donahue award each year to a community member for organizing advocacy. This year we honor Alderman Walter Burnett, Jr. (27th Ward) for being a courageous leader in the fight for housing for people experiencing homelessness in Chicago. He has lead-sponsored several significant initiatives in the Chicago City Council on behalf of coalitions led by CCH, and most recently, is the lead sponsor of Bring Chicago Home. He has been a strategic adviser and a steadfast ally. We are forever grateful for his contributions to CCH’s successes. CCH also honored the Polk Bros. Foundation for demonstrated leadership in its commitment to ending homelessness in Chicago. Through many years of funding and partnership, Polk Bros. has made a measurable impact in the lives of those experiencing homelessness, with particular emphasis on homeless youth. This work is led by Senior Program Officer Debbie Reznick, who is a widely recognized champion on this issue. By giving both voice and resources to the issue, Polk Bros. is a model for philanthropic engagement in lifting up housing as a human right. Our other honorees included Robert Henderson, a homeless leader and client of CCH. 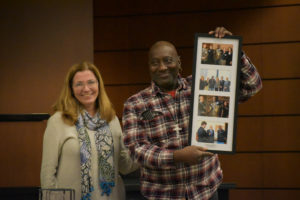 Robert was formerly homeless and living on the street when he became the first plaintiff to file a case under the Illinois Bill of Rights for the Homeless Act. CCH successfully settled his case this year, marking an important milestone for the development of this 2013 law. 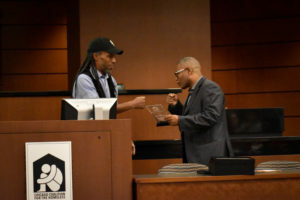 Robert has shown dedication and passion to advancing the rights of people experiencing homelessness through his case and his engagement with community organizing. 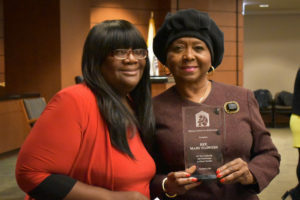 In addition, in celebrating legislative victories CCH honored State Rep. Mary Flowers and State Rep. Greg Harris (both D-Chicago). Their commitment and advocacy ensured that youth and families in Illinois are always at the heart of the agenda. Rep. Flowers sponsored the Creating Opportunities for Illinoisans in Need (COIN) Act, included in the 2018-2019 Illinois budget implementation bill. The amount of the Temporary Assistance for Needy Families (TANF) grant was increased only twice in 22 years. Monthly grants had fallen to 21% to 25% of the federal poverty level (FPL). With this legislation, monthly grants increased to 30% of FPL for all TANF cases, beginning October 1. Rep. Harris is a steadfast ally who worked with CCH to increase the Homeless Youth line item in the FY19 state budget. This funding betters the lives of homeless youth. In the past, Rep. Harris has sponsored legislation drafted by CCH that ensures accompanied youth have access to medical treatment. He also championed numerous causes that impact youth who experience homelessness in Illinois. We honored Heartland Alliance’s Samantha Tuttle, who works with CCH on the Restoring Rights and Opportunities Coalition of Illinois (RROCI). We commend her ongoing commitment to advocating for criminal justice reform. For years, Sam has worked on legislation to reform the overly punitive criminal justice system and has succeeded often. As a founding member of RROCI, Sam is a natural choice for this honor. CCH also honored Dan Lesser of the Sargent Shriver National Center on Poverty Law and Kim Drew of Heartland Alliance for dedicated efforts to address hunger on college campuses in Illinois. Thanks to their five years of legislative advocacy in partnership with CCH, SNAP benefits were expanded to an estimated 40,000 low-income community college students through Senate Bill 351. The College Hunger Bill was signed into law in July by Gov. Bruce Rauner. CCH leaders proudly display their ribbons honoring their efforts this year. Finally, CCH honored the HomeWorks coalition. CCH mobilized HomeWorks in 2015 to create affordable housing for homeless families and improve school services for homeless students in Chicago. Since its inception, HomeWorks and its service-provider partners have become a powerful force. HomeWorks helped secure an improved homeless education policy in the Chicago Public Schools. It also advocated for the city’s creation of Families in Transition, a housing program that offered permanent housing subsidies to 100 homeless families at six high-need CPS schools, including doubled-up families for the first time in a city-funded program. Most recently, the HomeWorks coalition secured a commitment of 250 CHA units for homeless families and youth. It also secured $355,000 in city funding for supportive services as the first 40 units become available next year. Over HomeWorks’ tenure, it has secured housing and services for over 1,000 people. Members of the HomeWorks coalition are the AIDS Foundation, Catholic Charities, CSH (Corporation for Supportive Housing), Facing Forward to End Homelessness, Family Rescue, Heartland Alliance, Inner Voice, Inspiration Corporation, New Moms, Inc., Primo Center for Women and Children, Renaissance Social Services, and Unity Parenting and Counseling.